Lilies have 6 petals (technically 3 are sepals). Bloom colours range from white, cream and yellow to orange, pink, red – all colours but blues and purples – and from pale to intense shades. 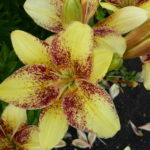 Some lily blooms showcase pure clear colours, while others have contrasting coloured throats, spots, freckles or brushmarks. Markings down the middle leading to the center of the flower are thought to assist insects in their search for nectar. Raised spots called papillae are also commonly found. Flower sizes range from small and delicate to large and robust, and can be found singly on a stem or as multiple blooms (up to 50) arranged in a variety of ways. Flower orientation varies as well, with some lifting their faces to the sky, some facing to the side and others gracefully drooping downwards. Flower shapes can resemble trumpets, bowls, or goblets depending on the degree to which the petals curve out and back from the center of the plant. In the most extreme case, the petals curve back towards the base of the flower, creating a turk’s cap shape. DoriJo with spots or freckles on the throat. Lily leaves are secondary to the showy flowers, but still offer an interesting texture in the garden. They can vary in size, number and distribution along the stem – some are scattered while others are in whorls, emerging from a single point along the stem and circling around it.Lily plants also range in size from short ,petite plants of 15 to 20 cm to taller varieties up to 1.5 to 2 meters in height, plus every height in between. 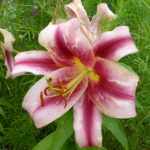 With all this variety in mind, it’s easy to see that there is the right lily for the right place in any garden. 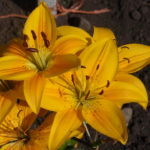 True lilies are lumped into a group of plants loosely identified as ‘bulbs’, more technically known as geophytes –‘geo’ meaning earth’, and phyte meaning plant. These plants survive at least a portion of the year below ground in a dormant state. Lilies are true bulbs along with snowdrops and hyacinths but geophytes include other types of structures including corms (crocus), rhizomes (iris), tubers (potatoes), tuberous stem (cyclamen), tuberous roots (dahlias). The lily bulb essentially contains all the plant parts, remaining dormant until the right conditions exist. These fleshy, underground structures have a basal plate (the modified stem of the plant) at the base, from which roots emerge. 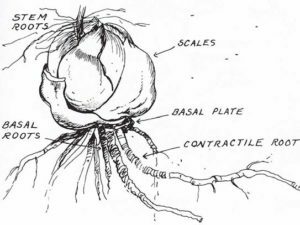 These roots anchor the lily plant into the ground, preventing it from blowing over in the wind, and to a small degree also help with accessing water and nutrients from the soil. . The layered scales above the basal plate are actually fleshy leaves, and these store food and thus the energy for plant growth (until the roots and above-ground leaves take over).At the top of the bulb is the new growing tip, from which the flower stem will emerge. This flower stem also forms roots (called ‘stem roots’), between the top of the bulb and the soil surface. These are crucial in enabling the plant to absorb enough nutrients – they are the main feeder roots. 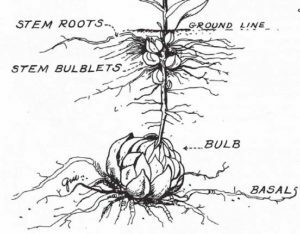 This is why it’s important to plant lily bulbs deep enough that these roots can develop. Lily bulbs must be handled and stored carefully. Avoid knocking or damaging the growing tip. Lily bulbs lack the protective papery skin (or tunic) found on other true bulb such as tulips or daffodils. They are known as imbricate (or non-tunicate) bulbs. This leads them to be even more susceptible to drying, so care must be taken to keep the bulbs cool and moist. 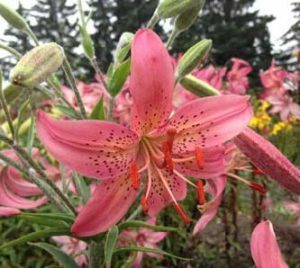 If you want to store lily bulbs clean them carefully and place in a plastic bag with some peat moss, wood shavings, vermiculite or something similar, and keep cool and moist. Watch for the next article, focusing on planting and culture.